8″ x 8″, softcover, 291 pages, full color illustrations, Island Press. 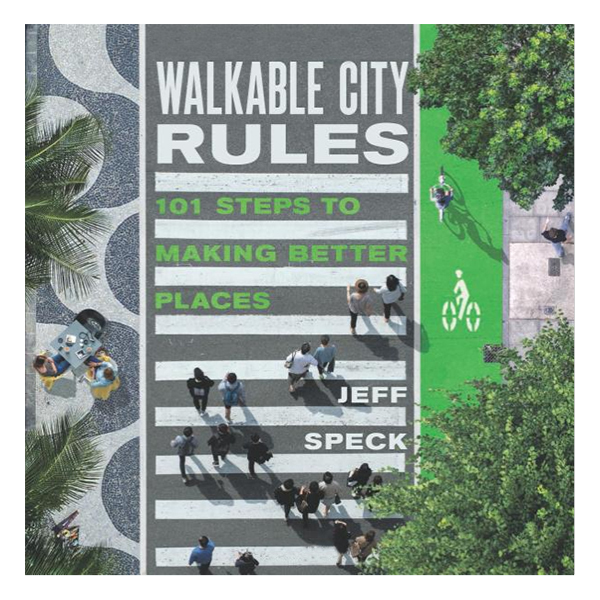 In Walkable City Rules, author Jeff Speck provides a blueprint for making city centers more lively, active and inviting. In this follow-up to his book, Walkable City, Speck aims to provide clear, concise, step-by-step guidance to usher in an era of renewed street life. The 101 rules are practical yet engaging — worded for active discussion, illustrated for clarity, and packed with specifications as well as data. For ease of use, the rules are grouped into 19 chapters that cover everything from selling the value of walkability, to getting the parking right, to making comfortable spaces and interesting places. Each chapter is introduced briefly, then each of the rules is presented in a two-page layout with a detailed explanation and illustrations. Walkable City Rules gives every city the tools to create more walkable streets. Jeff Speck is a city planner and urban designer who, through writing, lectures, and built work, advocates internationally for more walkable cities. As Director of Design at the National Endowment for the Arts, he oversaw the Mayors’ Institute on City Design and created the Governors’ Institute on Community Design. Walkable City Rules is guaranteed. If you are not 100% satisfied, you may return it within 30 days for a full refund.